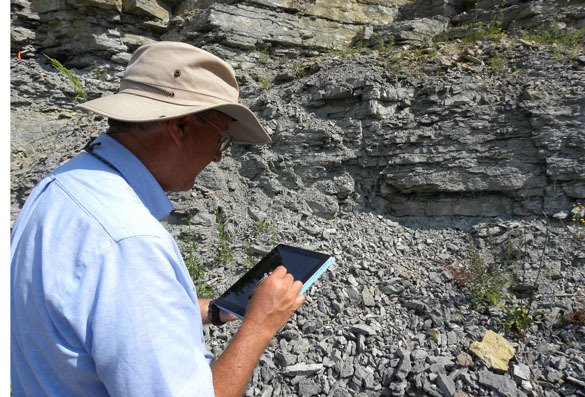 KÄINA, ESTONIA–It is not yet one of my regular bits of field equipment, and I am certainly far from an expert with its use, but I can say a few things about the value of an iPad in geological fieldwork. This summer I have used it in Israel, Poland and Estonia and it has served me very well. Despite the dramatic photos here, I have used my iPad2 mostly indoors. It is by far the most convenient field library I have ever had. Laptops are great for storing and displaying pdfs of papers and maps, but it just can’t beat the convenience of simple taps on the iPad screen to pull up astonishingly clear text and images. I use PDFReader Pro so I can easily zoom in and out on the screen with the classic Apple two-finger move. I add documents to this reader and others with Dropbox (recommended to me by Lisa Park), which has the advantage of syncing with all my other computers. (I seem to have more than a few now.) It has never been easier in a remote location to read documents and share them with students and colleagues. My trusty MacBook Pro seems terribly primitive for reading now. Although I haven’t used them on this trip, I want to mention the excellent geological map programs of Integrity Logic. I have map programs for California, Utah and Ohio. Each comes with 25 layers, including bedrock geology, roads, mines, earthquake epicenters and much more. They are essentially GIS products for the iPad and iPod. I’ve found them most useful when traveling through (or flying over) a region I want to know more about. I use Bamboo Paper for sketches in the field and with colleagues around the dinner table. It is great for outlining crazy ideas in six colors. As with Evernote, the results can be emailed from the iPad. (Although I must say, I haven’t made any such notes worthy of leaving the device!) By the way, for sketching I very much like the Boxwave Stylus rather than relying on my fat fingers. There is a behavioral barrier I’ve had to overcome before taking my iPad into the field itself. Carrying this precious machine in my backpack along with hammers, chisels, water bottles and, eventually, bags of rocks seemed a bad idea. I have a protective cover for the screen, but no sealed box for the whole iPad. I know they’re out there, but I haven’t found one I like. Instead I seal it into a separate pocket as far away from hard, sharp and wet things as possible. So far, no problems, but I hesitate pulling it out in the wilderness with all those hazards for electronics. I’ll get more accustomed to it, I’m sure. (Although I still feel that way about my camera.) Of course, no one would use an iPad in the rain — another reason I don’t work in Iceland. The most useful apps in the field are again PDFReader Pro for accessing documents downloaded through Dropbox, Evernote and Bamboo Paper. I have been experimenting with Sketchbook Express for taking photographs in the field with the iPad and then annotating them on the spot. It is a very useful way to remember something visual, and the images can be exported out through email. Again, none of these jottings are publication quality — they are quick notes to myself. There is much potential in this latter application for more sophisticated field observations and records. Taking an image of an outcrop with the iPad camera and then annotating it with Sketchbook Express. Finally, general iPad apps I like as a geologist include Disaster Alert (realtime maps of disasters around the world), Sunrise Clock (especially helpful when you’ve crossed significant amounts of latitude! ), Google Earth (of course), Star Walk (for starry nights), various language translation programs (I try), and GW Mail (for Groupwise email accounts — easier than accessing through a computer). Again, I’m just starting with the iPad so I know there is much I’m missing. It has not replaced my laptop (I can’t write blog posts with it, for example), so I’ve actually increased the electronics I carry around on trips. I had an awkward moment in the Tel Aviv airport when a security officer looked at my US cell phone, Israeli cell phone, iPod, iPad, Macbook Pro, and GPS and asked why I needed all these things! Indeed. The future no doubt will have some sort of iPad-like device that does it all. Feel free to add information and ideas through the comments below! Thanks a lot. That will make a whole new page of apps even on my lowly iPod. We looked at using the iPad for some geotechnical core logging, but the lack of a glare-free screen on the iPad as well as the lack of USB ports made us decide to use some old tablet Toughbook T-18’s instead. That said, I do have an iPod that I have used on another project to write my daily report while in the field, and then I e-mailed it to myself when I got home, popped it in to Word and cleaned it up in 10 minutes instead of typing it out; I saved myself about an hour a day doing this. I also have a number of papers saved to my iPod, as well as cheatsheets for the geotechnical work I’m doing. Another good App is the geologic glossary by AGI, though it is pricy at $30. It does have some problems, like if you search a general term like “fault” it will list a bunch of related terms, but it only lists the first 100, and for something like fault that might mean you only get terms starting with A-L and it is currently impossible to scroll terms from M-Z. I was trying to remember what the name of heat-vitrified fault gouge one day while showing some to a co-worker, and I could not find the term–pseudotachylite– through a search of related terms. Thanks, P Hughes. Yes, the glare on the screen of the iPad is distracting and sometimes difficult to avoid, but then it is also part of the extraordinary resolution of the images. Cool that you could use your iPod so effectively. I find it quit difficult to read my ipad in direct sun light, but still a great idea in how to use a ipad for your work. Hello. I’m an italian geologist and I’m actually workin with iPad in the field for a geological map project together with the University of Geology of Genoa (IT). During fieldwork I collect different kind of geological information (outcrops, measure, notes, photo, sample, etc) and I simply manage all these data with an amazing cartoghraphic&GIS app with iPad. 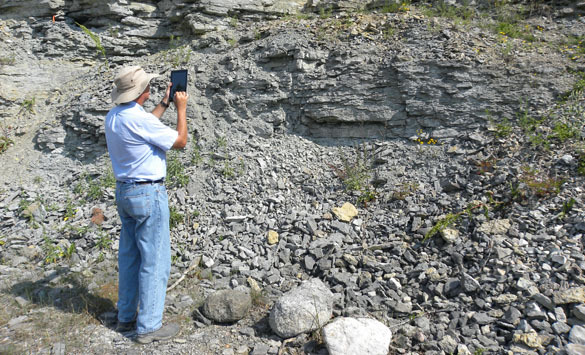 Ipad and iPhone technologies are very useful for this type of geological fieldwork!!! We tried this year fieldmapping with the ipad, but lacked a simple compass program like the http://www.mcfoi.it/egeo_compass/ egeo compass on the android. anyone knows something similar? I started using a new ipad (ipad 3) this year for fieldwork and geologic mapping in the USA, and though it will never replace my paper basemap or Brunton it is a great field tool. I use several different apps on it. My favorite for mapping is a free app called pdf maps by Avenza. With this app I can pull a US topo 7.5 minute geopdf (these are the new topo maps by the USGS) and then I have the contours over a new FSA aerial photo and can track my position anywhere on the quad. I can download them while in the field from the website (or from dropbox) or I can pre-load them on wifi at home. This app lets me set waypoints and add attributes in the field(table columns), and I can populate a table with as much data as I want. Downside is you cant turn off the background aerial that comes with the geopdf topo maps, so sometimes I se an app called topo maps; it can set simple waypoints too but it uses the older USGS topo maps. Downside is I can only use these for point data. Soon I am going to experiment with an inexpensive app called i-gis for mapping contacts in the field and other linework. The camera on the new ipad is a great improvement, and my favorite use of the ipad in the field is the probably the ability to take georeferenced photos; the large display makes it much easier to judge the quality of the photos is much easier than on a small phone. My greatest fear is losing data if I break or lose the ipad, so I got a ruggidized, mil-spec case and splurged for the data plan. With the data plan photos I take are automatically sent to my Dropbox or a Picasa web album. If I am in areas with poor cell coverage, I use an app called photosync and can batch-send all the photos at the end of the day when i am in range. I use google docs for taking notes and they are continually updated. Another great benefit of the data plan is the ability to use an app called soilweb, which queries the USDA soil database and gives you soil data based on your gps position. This app is available for iphones and android phones. Two other handy and fun apps I am experimenting with are photometa and geocam. I am looking for an ipad app tha will let me easily make graphical lithologic columns similar to what wellcad or logplot can do. 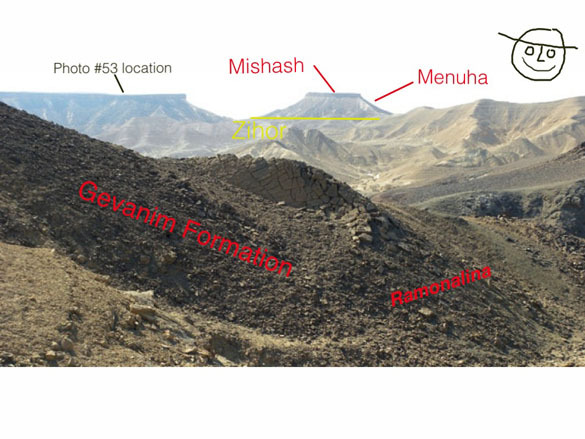 Thanks, Geomorphologist, for such a detailed comment about your very sophisticated use of the iPad in the field. The first thing I’m doing is getting that Avenza map ap! These devices never cease to amaze me. As an app developer I am always excited to see tablets and other mobile devices being used outside of the conventional way. They have really allowed for people to do some serious computing on the go. I’ve been using an HTC Flyer over the last 12 months as a field notebook. I’ve found it really useful, easy to hold one-handed with it’s 7″ screen, and the stylus is really well integrated. It was very expensive when it came out, but the price has dropped a lot. With an anti-glare screen protector, and a hinged case to provide some shade, very useable, even in very bright conditions. The native notes function is well integrated with Evernote, and Sketchbook, Dropbox, Rocklogger and PDF viewer all work well. Couldn’t get QGIS running though. I’ve found it a very good replacement for a field notebook, though obviously you should always carry a spare notebook and pencil, as that’s good drills. For RC logging, a bluetooth keyboard is a necessity, the screen is too small to use easily for that. Good to see the ipad (and tablets in general) becoming the useful piece of equipment they really are. Portability plus power are a huge advantage to our mobile discipline. 1. Use a Logitech bluetooth keyboard fr excellent data entry possibilities. I have switched away from my laptop for this reason, my finger plus a full keyboard are all I need when I get back to my hotel room. And it weighs next to nothing! 2. I cannot recommend UXWrite enough as THE best science app available. It is a modern Latex-like word processor for writing reports. I wish this was there when I was in college, it has literally shaved hours off my daily workload for report writing. For simple reports, it does a LATEX typesetting job for you, with an easy interface (think LyX for the iPad). Still in development, but its moving fast. Worth every penny if you write reports. Or papers. 3. TeXPad is a decent LateX client, but I use UXWrite more. UX Write uses HTML5 as its base, not Tex code. 4. EverNote, and Sketch are both excellent note taking apps for the field. Sketch is GREAT for roadside discussions. Take your shot and annotate NFL style. EXCELLENT and free. And a question – I want to log core with my ipad – any recommendations other than a Spreadsheet app? Hello Jerome! Great to have you join the conversation, and with such excellent (and specific) ideas. This is our most-hit blog entry, so you may get an answer to your question about logging core. Love your article Mark. I actually found it by searching iPad in field work. Your tips helped me and gave me some ideas for when I’m out in the field. I’m still trying to educate myself on some of the apps you can download and use to make my job easier. We have created a simple iPhone application with the purpose to record observations in the field i.e., a picture + note + GPS location so that a collection of these can be saved out as a KMZ file. The KMZ file in turn can then be visualized in Google Earth. We are still testing the application – for anyone interested to try it out, write me an email and we’ll send instructions to get it installed through Apple’s Testflight program. Though the application is not specifically written for a geology workflow, I do believe it can be of use to anyone in this field. We are open to make changes to the application so it fits your purpose better. If you want to have a quick look what this application can do, head over to our web site: http://lokate.systability.com Again send an email if you want to try out the app or if instead you just want to email us your comments, wishes and ideas, that is fine too! Thanks, Joost! I am circulating this offer to my colleagues. Looks quite useful and an excellent innovation. I found this article quite interesting! I am an undergraduate geology student. A friend and I are interested in developing an app (mainly for amateur geologists) that would allow you to pin an outcrop on a map with a short description so that other geo-fanatics could find and interpret interesting outcrops: imagine this as an open-source app version of the popular Roadside Geology books, but created by anyone interested in contributing. We imagine such an app could be really helpful for geology students as well, both to contribute to and to use. We are currently asking geologists such as yourselves whether you would use or contribute to such an app, as well as whether you think the app is a good idea generally. Any and all feedback is appreciated! Hello Liza: I think such an app is a great idea for geology enthusiasts. Your analogy with the Roadside Guides makes sense — a digital, crowd-sourced version. I don’t see myself contributing simply because I wouldn’t have the time. Some outcrops as well are better not advertised because they may be sensitive and need protection from random collectors. Nevertheless, for many geological sites this would be cool. Good luck!